Slack brings team communication and collaboration into one place so you can get more work done, whether you belong to a large enterprise or a small business. Check off your to-do list and move your projects forward by bringing the right people, conversations, tools, and information you need together. 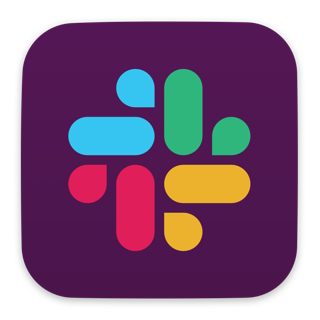 Slack is available on any device, so you can find and access your team and your work, whether you’re at your desk or on the go. Scientifically proven (or at least rumored) to make your working life simpler, more pleasant, and more productive. We hope you’ll give Slack a try. • Links in some Slack App buttons were not working , taking you nowhere, instead of the expected somewhere. They now whisk you away to the url you thought they would take you to in the first place. I have a love/hate relationship with chat applications, but I think Slack kind of sets the bar for them at this point. The app does basically everything I could ask of it, and it’s quite responsive. I’ve also noticed lately that there are lots of times I think “man it’d be nice if Slack did ___”, and then before long I open the recently-updated app and that feature appears. (A good example of this, I think, is the way you can now set a status in Slack to expire after a certain amount of time, which is great for something like a ‘working remotely’ status that you want to disappear at the end of the day). This is a tendency that I’ve seen in only a handful of apps/services, and I think it shows a high degree of responsiveness to the needs of their customers, which is awesome. First off, thank you slack for a great app. The note taking section to yourself is fantastic as well, among other features. The only reason for the stars is that I have one big issue with the app that I want to see improved. tl;dr: Please optimize the way slack handles pictures! We use in our small law office. We had to write some of our own "best practice rules" (like phone message channels only get phone messages, no gifs in general, snooze when you aren't answering) but it's been a great tool for our office. Easy way to be sure you're keeping up with your team without getting in to email all the time. We love it because if person a has a question for person b, a send the question and b gets to answer when they have the time in their day. Minimize interruptions while also allowing the person with a question to say it when they're thinking about it. We love slack. It's AOL instant messenger for professionals. I do wish it was easier to upload images etc without the comments being a weird title.